Well located, cosy accommodation. Good value for money. Family of five (2 adults/3 kids) staying for ski holiday in April. Accommodation was exactly as advertised. Limited space for a large group with small living and entertainment space but perfect for somewhere to get your heads down after a day on the slopes. Two cabin type double beds with limited head space and two single bunk beds. 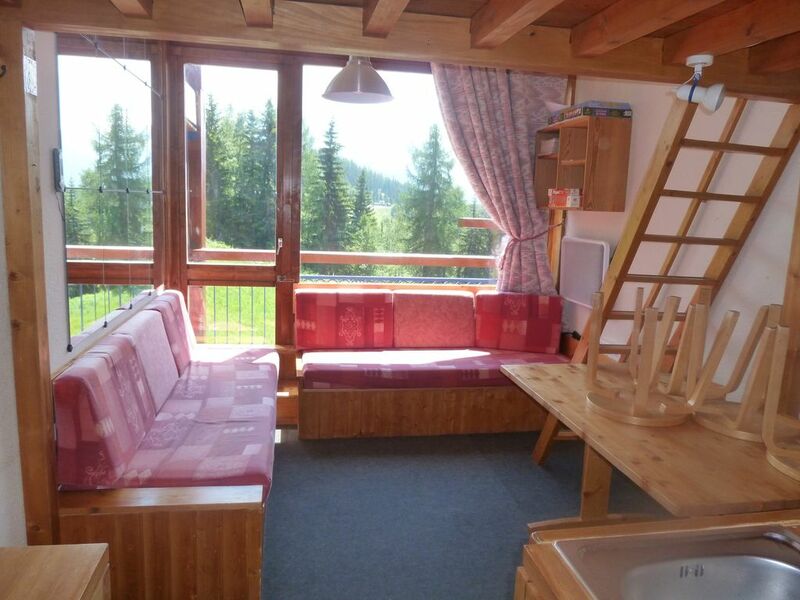 Very small kitchen area, basic bathroom and cosy sitting area with fantastic alpine views. Easy walking distance to lifts, bars, restaurants and shops. Very good for an affordable stay in a great location in Arcs 1800. Only negative points would be the fees charged by the management agency for cleaning (€70). This is excessive for such a small property. We chose to self clean but the provision of cleaning products/utensils is very limited. Also no loo roll at all provided so make sure you visit the supermarket before you head up to Arcs 1800. Overall I would thoroughly recommend the apartment for a small, affordable and well located base to enjoy a great resort. Apt had all the necessary equipment which made cooking easy. Sleeping 5 would be a squeeze but fine for 3 of us. Well located within easy reach of slopes and shops and restaurants. Very well located apartment for quick and easy access to slopes, shops, & restaurants. We stayed as a family of 4. Our children are 10 & 12. Firstly, I would recommend this apartment for 4-5 people. Just be aware it is compact but "does what it says on the tin". There are 2 bunk beds set in off the hall with privacy curtain. Would suit up to adults no issue. There is a double high bunk above the bunk beds. I would not put anyone under the age of 10 in here from a safety perspective of getting up and down the ladder. The double bed above the kitchen on the mezzanine is fine for 2 adults. There is reasonable storage space for clothing and propping up skis/boots at the end of the day. The bathroom has seemingly never ending hot water which is good for baths and showers. The kitchen is basic but ample for breakfast and doing pasta style dinner. There are plenty of plates, bowls, mugs, glasses, pots/pans etc. We ate in every other night on our stay and it worked fine. The TV has BBC1 and BBC2 plus a load of European channels should you need it. Only takes a few minutes to walk to the Sherpa supermarket. It is not a cheap shop but well stocked as you would expect. Open 8am-8pm. We took a hire car from Geneva that took 3hrs each way. I pre booked underground parking that is in the basement of the apartment block which I would recommend. I would have no issue staying here again. It is well priced and provided all you need for a weeks skiing accommodation. As an aside, the Mille8 swimming pool is only about 10 mins walk. That information is not completely clear from the Les Arcs website. The Mountain Concierge was excellent also. No issue collecting kegs and getting some guidance on initially where to go and what to do. We also hired linen and towels from them which were exactly as advertised. Have put as 4 stars as the furnishing has a bit of wear and tear as it is clearly well used. This is not a negative but I would reserve 5 star for something recently refurbished and more modern. Perfect for a short break with friends which was all about maximising time on the mountain. Short walk to the lifts. Lots of great bars and restaurants on the doorstep. Owners were very helpful in responding to my queries before arrival. Concierge were fab at check in and out. Would definitely book again. Superb value for money. We had a great stay in the studio. It is well equipped and the space is very well used so was very comfortable for four adultes. Access to the lifts is easy via an elevator and a short walk. Key collection and check out simple. Highly recommended! "Cleaniless was of a high standard as well all amenities provided. The surrounding were exceptional along with the view. The access for of high quality."